Twenty years ago, online learning was still in its infancy. Today, some 6.3 million higher education students—more than 30 percent of the total enrolled—take at least one online course. Online courses may seem at first glance to be impersonal and scripted, and yet for the best ones, the reverse is actually true: They involve every student (not just the talkative ones) and can offer a level of depth that is unsurpassed by even the best traditional classes. If you’re looking into graduate studies, is online learning right for you? To answer that question, it helps to know how these courses are envisioned and what they require of teachers and students. The benefits of online courses are potentially great, but to take advantage of those benefits students need to be organized, motivated, and self-disciplined. Much has changed since the early years, when “online” meant that instructors simply put their lectures and assignment online. Now, “it’s almost like it’s been conceptualized from the beginning as an online activity,” said Shenita Ray, director of online operations for Georgetown’s School of Continuing Studies. So, with today’s abundance of online learning options, how do you go about selecting a program? Before picking a university’s online learning program, you should research the institution to determine the academic qualifications of the instructors, just as you would with a traditional face-to-face program. 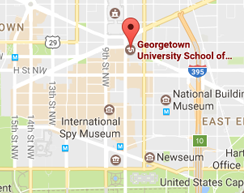 In addition, if you’re considering a professional studies program like those offered at Georgetown, you should consider the instructor’s industry experience as well. The next step is to look at the design of the courses within the program. Are there a variety of activities, such as lectures, discussion groups, and group projects? Steinberg said the best courses are planned with the assistance of an “instructional designer,” who helps the instructor—sometimes known as the subject matter expert (SME)—determine how the material should be presented. One of the biggest advantages of online learning is the flexibility it offers both students and instructors. Georgetown’s professional studies courses are asynchronous, meaning that most of the work, including most class discussions, can be done when it is convenient for students. For busy students balancing their time between work, family, and school, this flexibility is invaluable. But “flexible” doesn’t mean easy—not for the professor or the students. Students also need to exhibit a higher level of engagement: there is no way to sit in the back of the classroom and not participate. “When an instructor asks a question in the online environment, every student has to answer that question,” Ray said. The requirement that everyone must participate also points to another characteristic of virtual learning that may seem counterintuitive: An online course has the potential to be more personal, even though the class is not meeting in a traditional classroom. Because everyone has to participate, everyone’s voice is heard, including those who may not feel comfortable speaking up in a brick-and-mortar classroom.